Migraine Monologues: Botox Breaking News! I was going to continue my rant about Migrainism but a good friend sent me a link to this article in the DailyMail.co.uk stating that “Migraine Victims could get Botox on the NHS”! I’m a big fan of the Daily Mail website. Fear not, I don’t adhere to its politics, just its celebrity gossip. It’s a highly addictive website, in fact I plan to give it up for Lent. Anyway, as usual, the Daily Mail headline is a slight exaggeration. The National Migraine Centre sensibly posted the BBC version of the same news item which has a far duller, if more accurate, headline: “Not enough evidence for Botox Migraine Jab, says NICE”. The model is a MIDDLE AGED RED-HEAD. My Father thinks this is hysterical (as I have copper auburn locks and am now the wrong side of 30). It suggests the Yanks are miles ahead of the Brits getting this out in the market place. On the other pages there is even a coupon and a Blackberry app thing to take to your Doctor. 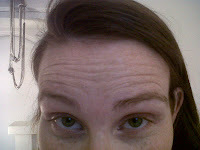 I have actually tried Botox - for my migraines - not my wrinkles. 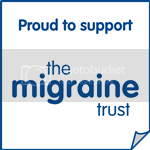 Two years ago it was licensed for use in patients with chronic migraine only (15 days of headache, 8 of which are migraine). 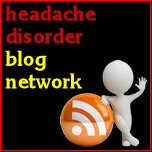 I was given the name of a specialist doctor by The National Migraine Centre, where you can now get Botox for headaches. If you might be a candidate, take a look at the fact sheet from its website, because Botox is not suitable for all types of migraine. In August last year I was having a particularly bad run (and as you can see from my TRIED & TESTED page I’d tried most other options), so off I went to the recommended doctor with my Dad in tow. Now, my Dad is the kind of man who believes a hearty lunch will set one up for the day, and we happened to find a delightful French restaurant doing a great deal nearby. We were even offered free champagne refills after an incident involving a fruit fly; but I digress... Needless to say Dad and I arrived to meet the doctor in high spirits. We liked him immediately. He wore a bow tie, which automatically made him classy in my book. Much discussion about the merits of bow tie wearing ensued. Dr Botox, as I shall now refer to him, was chatty, amiable and within ten minutes of meeting me said “Well you are clearly a very intelligent young woman”. The use of the word ‘young’ obviously had nothing whatsoever to do with why I liked him. In all seriousness, Dr Botox is a prestigious migraine specialist leading the field in the use of Botox and migraine. He is, I believe, involved in the trial mentioned in the articles above and explained to me, in great detail, the research results thus far. Lots of graphs and numbers were presented but at this point the champagne was kicking in. The main problem, I think, is that it’s very hard to do a placebo with Botox. Even if you’re injecting Saline you’re still putting needles into people's heads giving them, in essence, a kind of acupuncture. And even the Saline itself has been shown to help with migraine, no one quite knows why. 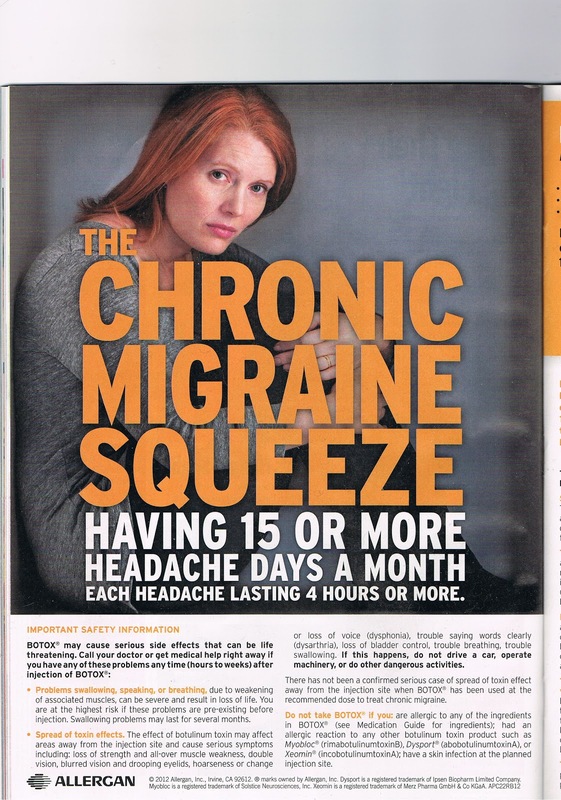 However, the overall research does show a reduction of days in pain for patients with chronic migraine. Again, as with most migraine remedies, no one is quite sure how or why it works. The simplest explanation is that it probably jams the pain signals because it interferes with nerve activity, not that it paralyses all the muscles in your head, as I had assumed. To cut a long story short, I ended up having approximately 29 injections of Botox across my forehead, scalp and neck. And it bloody hurt. I even made Dad hold my hand (and at one point I heard a yelp, and realized it was coming from him.) But, I have paper thin, albino white red-head skin. Research shows (and yes I will send it to you if you like), that redheads really do have a lower threshold for pain. My raven-haired sister has had Botox for a non-existent wrinkle in her forehead (I’m going to be in so much trouble for sharing this) and she said it didn’t hurt at all, just pricked. Anyway, for me it was a kind of wasp-sting pain, but not a lasting pain. And there was also a bit of blood. I needed a sticking plaster. I felt pretty sick and dizzy, which is not surprising after having 29 injections over the most sensitive bit of your head, and I got a migraine later that night. Even my raven-haired sister got a headache after her cosmetic Botox. Did Botox help my migraines? 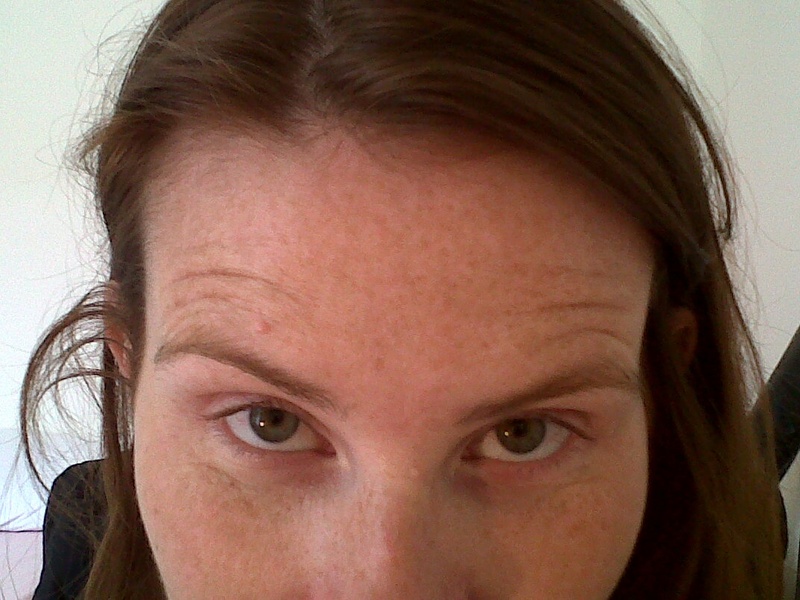 It can take a few weeks for the Botox to start to work, so initially I didn’t notice much difference, but my face and scalp started to feel a bit weird and tingly quite quickly. I did notice a cosmetic difference almost right away! Below are two extremely hideous pictures I took on my phone just before, and a couple of days after, the treatment. If I raise my eyebrows in an “Oh my God I just won the lottery!” surprised fashion, you will see I get a solid row of lines across my forehead in the ‘before’ picture. In the ‘after’ picture you can see that when I try to create the same expression, the lines in the middle stop. As the Botox kicked in over time the lines totally disappeared! A pleasant benefit! Overall, I do think the Botox helped break the pain cycle I was in at the time. I had a pain free week where I was able to go away with my family and the first few migraines after that seemed to take longer to get started, if that makes sense, which gave me a better warning period. But then they returned as normal, so it’s hard to tell. You’re meant to have three rounds of Botox (as it wears off after approximately 12 weeks) in order to gauge its real efficacy but my health insurance wouldn’t pay for it. Baddies. And obviously the NHS hasn't quite realized the benefits Botox could have – but I'm sure it’ll get there. I would probably have paid for more out of my own pocket (or rather my Dad’s generous ones, if I’m honest) but I then discovered some other issues and am about to embark on various injections in my spine and I don’t want to confuse the two treatments. When this is over I may return to lovely Dr Botox and give it a full try; not just because I like the idea of having an immobile, wrinkle free forehead, or even because I really like the idea of not taking heavy-duty prescription drugs every day, but because it is so refreshing to meet a doctor who finally recognizes what an “intelligent young woman” I am! Next time: Migrainist Part II and why PCT's are trying to stop patients using Zomig! I love Doctors in bow ties. Bow ties are cool. 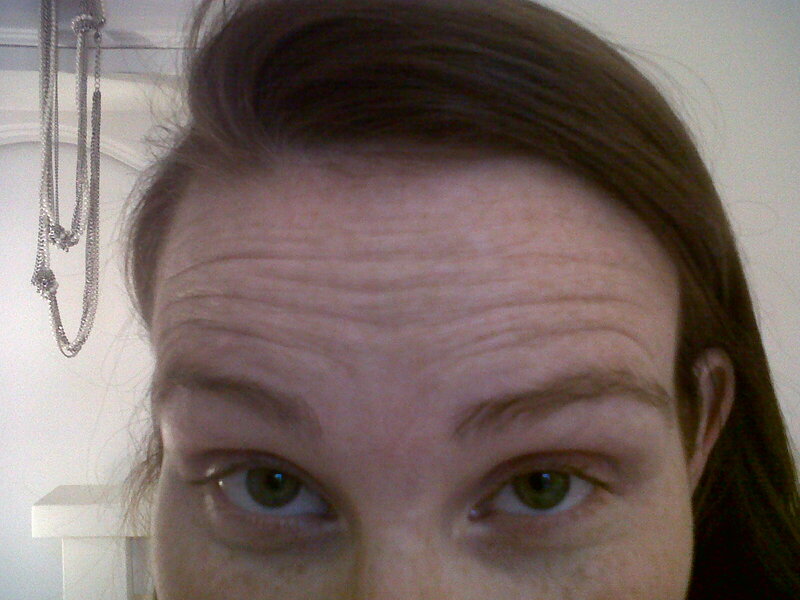 That said, I find the lack of "OMG-eyebrow-wrinkles" a little bizarre. I mean, obviously go back and see if Botox'll help your migraines more, but it's nice to be able see expressions on people's faces.